1 F None No Power Seat 1 F is a standard First Class seat however, the proximity to the lavatory and galley may be bothersome. 14 A None No Power Seat 14 A is a standard Economy seat that may have limited recline and a misaligned window. 14 C None No Power Seat 14 C is a standard Economy seat that may have limited recline. 14 D None No Power Seat 14 D is a standard Economy seat that may have limited recline. 14 F None No Power Seat 14 F is a standard Economy seat that may have limited recline. 15 A None No Power Seat 15 A is a Main Cabin Extra seat that has extra legroom due to the exit however, may also have limited recline due to the exit row behind. 15 C None No Power Seat 15 C is a Main Cabin Extra seat that has extra legroom due to the exit however, may also have limited recline due to the exit row behind. 15 D None No Power Seat 15 D is a Main Cabin Extra seat that has extra legroom due to the exit however, may also have limited recline due to the exit row behind. 15 F None No Power Seat 15 F is a Main Cabin Extra seat that has extra legroom due to the exit however, may also have limited recline due to the exit row behind. 16 A None No Power Seat 16 A is a Main Cabin Extra seat that has extra legroom due to the exit. 16 C None No Power Seat 16 C is a Main Cabin Extra seat that has extra legroom due to the exit. 16 D None No Power Seat 16 D is a Main Cabin Extra seat that has extra legroom due to the exit. 16 F None No Power Seat 16 F is a Main Cabin Extra seat that has extra legroom due to the exit. 22 C None No Power Seat 22 C is a standard Economy seat however, the proximity to the lavatory may be bothersome. 22 D None No Power Seat 22 D is a standard Economy seat however, the proximity to the lavatory may be bothersome. 23 A None No Power Seat 23 A is a standard Economy seat in the last row of the aircraft that may have limited recline. The proximity to the lavatory may be bothersome. 23 C None No Power Seat 23 C is a standard Economy seat in the last row of the aircraft that may have limited recline. The proximity to the lavatory may be bothersome. 23 D None No Power Seat 23 D is a standard Economy seat in the last row of the aircraft that may have limited recline. The proximity to the lavatory may be bothersome. 23 F None No Power Seat 23 F is a standard Economy seat in the last row of the aircraft that may have limited recline. The proximity to the lavatory may be bothersome. 4 D None No Power Seat 4 D is a standard First Class seat that has limited recline. Onboard storage is limited and suitcases may need to be checked at the aircraft door to be picked-up upon arrival. There is no inflight entertainment onboard this aircraft. I would make 8A, 8D and 8F green due to legroom. The seats in row 4 are far away and even the tallest person would be able to stretch their legs. 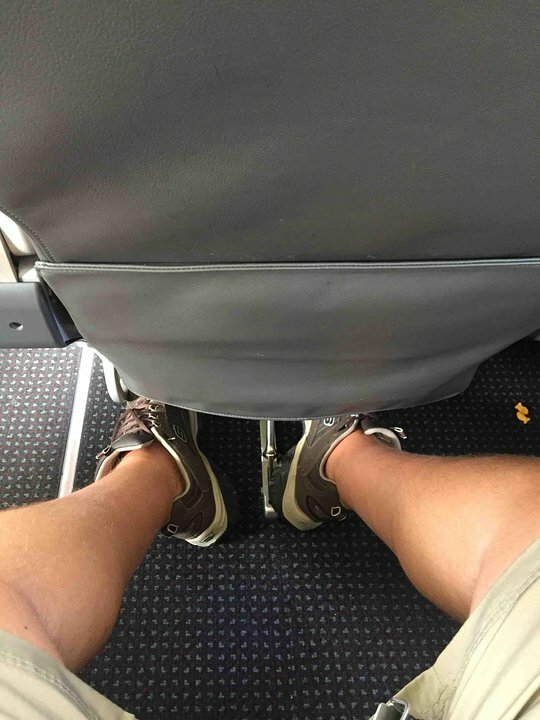 8C has unlimited legroom because of the "bend" in the aisle, but there is nowhere to put an "under the seat in front of you" item. I'd make it yellow. 14A is misaligned with window. Window is very far forward relative to the seat. Great seat. Legroom was good (enough to stretch legs. It's one row of first class on one side, 2 rows on the other side. Overall, a good experience! Seat tight with minimal legroom. No frills, not even a place to charge ones phone. Table had damaged hinge. Emergency instructions say to use seat cushion as a floating device, yet the seats have no detachable cushions. Yes the seats are a little narrow but there was PLENTY of leg space. It was about a 2 hour flight and was completely comfortable. Probably best coach seat in the American fleet! So comfortable, and so much leg room i could stretch my legs straight out and not touch the seat in front. Best part, no curtain or wall. Was able to put my backpack under first class seat in front of me. 4F has plenty of leg room and space but sadly did not recline any. 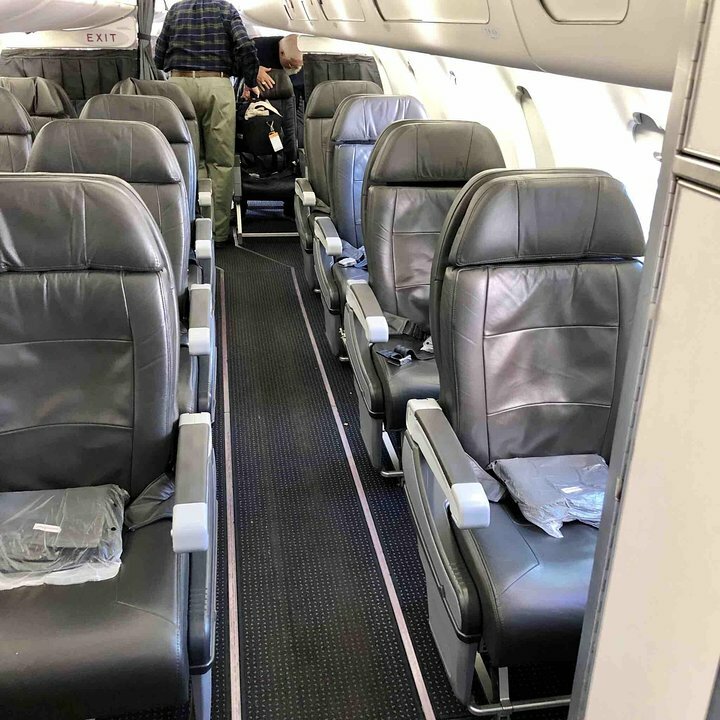 The seats in Row 15 (A, C, D, and F) are extremely narrow. 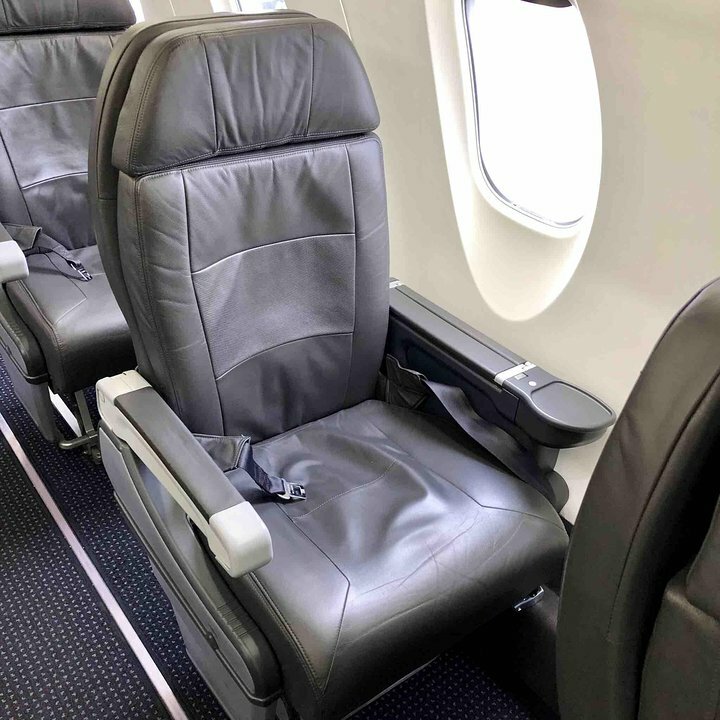 The aisle seats have solid dividers up to the armrest, and a protruding metal piece in the window seats will poke you in the hip. If you are skinny - great. Average or a little plump? Don't sit here! Seat has the full rigid "wall" armrests and not the liftable "arm", so the seat feels narrower than a standard seat. Legroom is outstanding, but if you're tall like me (6'6") take this seat over the window (16A) as you'd be banging your head on the low ceiling. 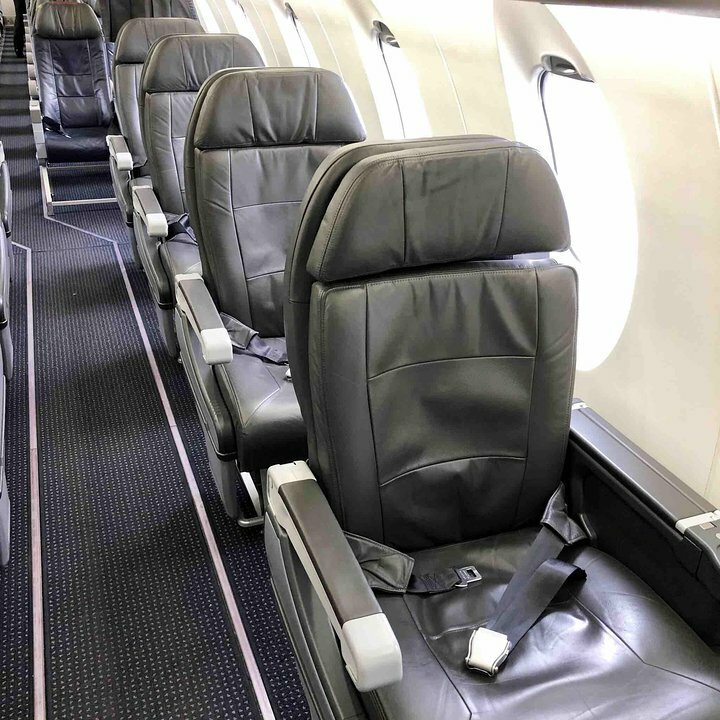 I'd recommend adding a mixed review for any of the exit row seats on newer CRJ-900s and 700s. There are no window shades on many of these planes, which may not be desirable for some passengers. Avoid this aircraft except during daylight hours. The overhead reading lights provide the illumination equivalent to perhaps a dozen fireflies. Once the main cabin lights were shut off I had to resort to using a flashlight to read my book. 8D,F are fantastic. You must sit on this side for a lap child. I could sit on the floor with baby. It's also quiet. We had to valet check roller bags. Limited overhead compartment. Lots of leg room. Definitely recommend this seat. The good: I did not realize this was a Main Cabin Extra seat until I sat down...plenty of legroom. The bad: The window is misaligned. To see anything you have lean way forward. 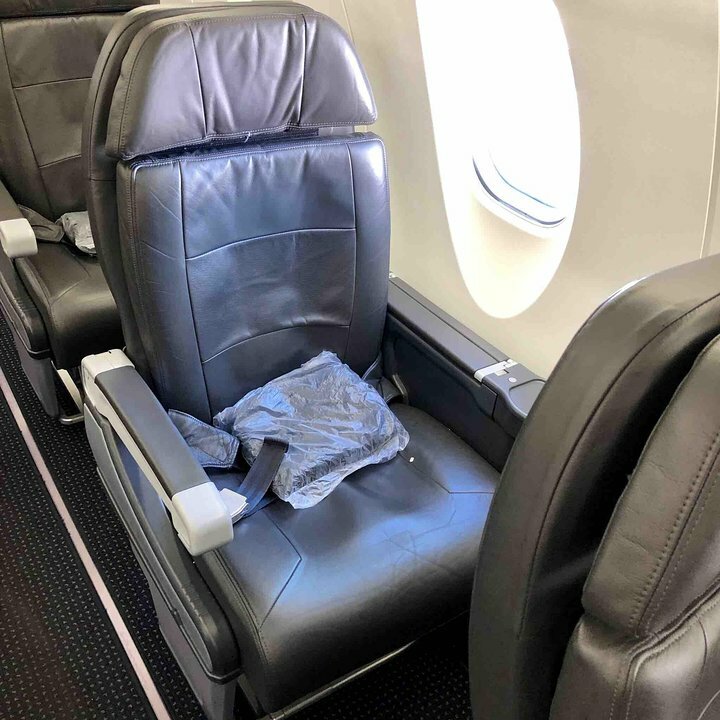 Other than the window alignment, this seat is ok for a short flight. Last row on the plane. For a short flight it was not bad. The flight attendant sits in a jump seat in the middle. I had a friendly attendant and spoke with her part of the flight. Great plane, good seat. Flew BWI to CLT on this VERY new plane. Cabin crew was very friendly. Even on this short flight they offered drinks but no food. Good seat, like premium economy for the price of economy. This seat was a real MCE seat, so leg room was good. It would have been not so much fun though on the width with another person in the seat next to me. He moved to a different open seat. One of the better newer planes in the AA fleet.